India has a “blood mica” problem. Deep within the South Asian nation’s off-the-books “ghost” mines, children as young as 5 toil alongside adults to pick and sort the mineral that gives makeup and car paint their coveted shimmer. A three-month investigation by the Thomson Reuters Foundation, however, found that children were risking more than superficial injuries or respiratory infections; they were also dying. In the major mica-producing states of Jharkhand, Bihar, Rajasthan, and Andhra Pradesh, where child labor is rampant, seven were killed in the past two months alone. Fewer than 10 percent of these deaths are reported, according to Bachpan Bachao Andolan, a child-welfare organization founded by Nobel laureate Kailash Satyarthi, whose name means “Save the Childhood Movement” in Hindi. Rather than risk ending the illegal mining the provides income for some of India’s poorest, most of the victims’ families choose to accept a payment for their loss instead. Such was the case in Bihar, where a farmer said he was promised 100,000 rupees ($1,500) after the death of his 16-year-old son in an unregulated mica mine in the neighboring state of Jharkhand on June 23. Neither has he received his compensation. Although Indian law forbids children under the age of 18 from working in mines and other hazardous industries, many families who live in abject poverty depend on them to supplement the household income. The Centre for Research on Multinational Corporations in the Netherlands says up to 20,000 children are associated with mica production in Jharkhand and Bihar. India is one of the world’s leading suppliers of mica. Numbers from India’s Bureau of Mines show the country produced 19,000 tons of mica in 2013/14—officially, that is. The same figures show exports were 128,000 tons, with more than half it—62 percent to be exact—dispatched to China. The rest went to Japan, the United States, the Netherlands and France. Experts estimate that about 70 percent of mica production in India is from illegal mining in forests and abandoned mines. Plenty of deals are conducted over mobile phones, leaving no paper trails as the mineral leaves India for manufacturers overseas. Up to 10 percent of the global supply of mica is used in cosmetics. 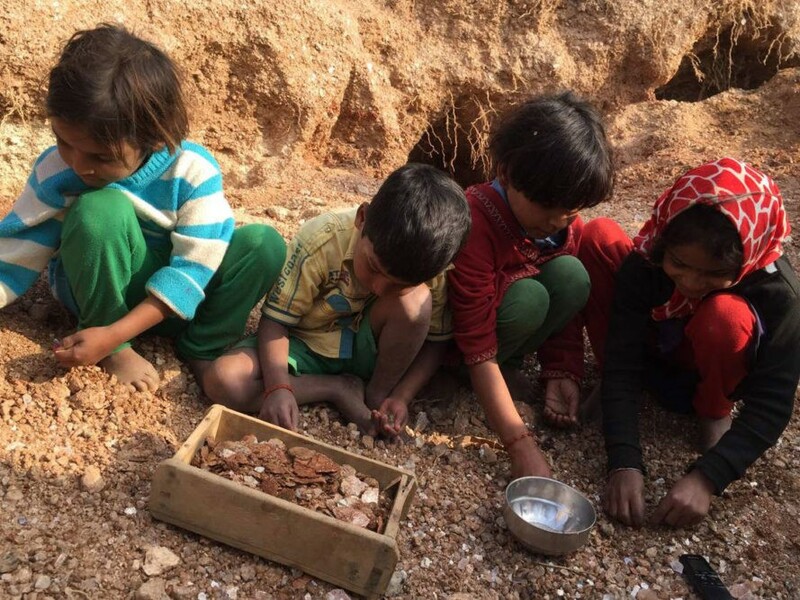 Some companies, notably LUSH in 2014, have moved away from natural mica over concerns about child labor. Simon Constantine, LUSH’s head of ethical trading, said he suspected something was off when armed guards were needed to accompany auditors to one of the firm’s supplier mines in India. 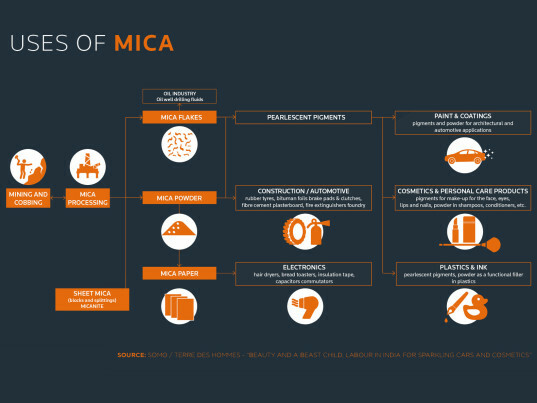 Despite extracting itself from the mica supply chain in 2014, the beauty company recently discovered that the synthetic mica it was using contained traces of the real thing. L’Oréal, which sources 60 percent of its natural mica from the United States, and the rest from countries such as India, said it’s committed to sourcing sustainable mica. Nearly 97 percent of its mica comes from completely verified sources today, the company said. That number will increase to 100 percent by the end of 2016. The Natural Resources Stewardship Circle, a French nonprofit that rallied together L’Oreal and other key stakeholders at a responsible mica sourcing summit in Delhi in February, said that it was finishing up a five-year plan to mitigate child labor by improving living conditions in mica-producing communities. 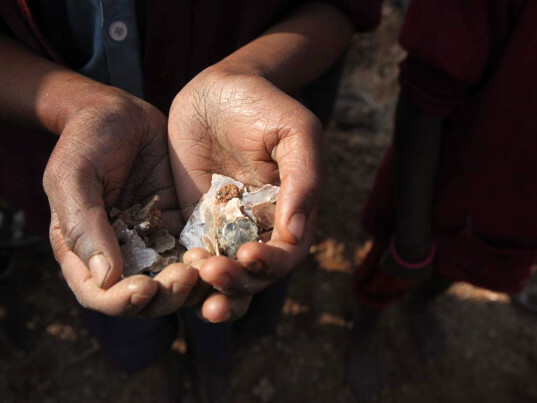 In India, government officials appear to veer from admitting that child labor is a problem in some mica mines to denying reports that children were dying as a result of mica mining. Dhanraj Sharma, a commissioner in Rajasthan’s Labour Ministry, said he was unaware of child workers in the mines. India has a "blood mica" problem. Deep within the South Asian nation's off-the-books "ghost" mines, children as young as 5 toil alongside adults to pick and sort the mineral that gives makeup and car paint their coveted shimmer. A three-month investigation by the Thomson Reuters Foundation, however, found that children were risking more than superficial injuries or respiratory infections; they were also dying. In the major mica-producing states of Jharkhand, Bihar, Rajasthan, and Andhra Pradesh, where child labor is rampant, seven were killed in the past two months alone. Fewer than 10 percent of these deaths are reported, according to Bachpan Bachao Andolan, a child-welfare organization founded by Nobel laureate Kailash Satyarthi, whose name means �Save the Childhood Movement� in Hindi.